It would be safe to say we have today gained an impression that a garden is a timeless expression of man’s relationship with nature. It is not so much a place of solitary retreat any more, but a work of art through which we can reveal our inner self to the outside world. Just as our world is constantly changing to accommodate man’s overpopulation of it, so must our minds remain open to new ways of exploring how that relationship can, and will continue. Will design remain the way in which nature can still hold sway by subjecting it to the rules of art? Two centuries after the luminous enchantment of seventeenth century French artist Claude Lorrain (1600 – 1682), who placed classical ruins in an idealized landscape one that used light and shadow to depict morning, noon and evening came French painter Claude Monet (1840 – 1926). 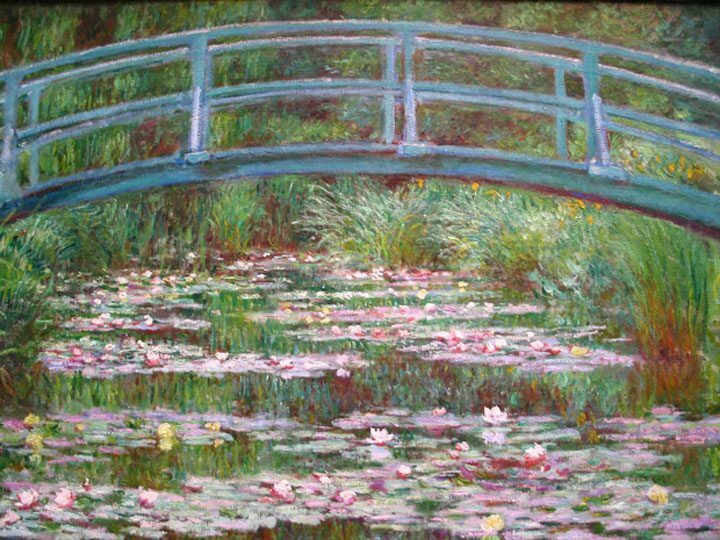 Claude Monet’s works and his garden at Giverny in France offer a great first impression of the relationship between art, and the beauty and romance of a garden sited in the French landscape. They have left a lasting impression through their pleasing and emotionally satisfying imagery. Viewing the landscape as a wonderful painting is a passive experience and a profoundly enriching one. No painting represents, or strives to represent the world as it really appears. The viewer is left to plumb the depths of their imagination and experience in order to arrive at an interpretation of the image before them. The co-relationship between the art of gardens and the art of painting was integral to the reshaping of the landscape of England by such as gardener and designer William Kent (1685 – 1748), who declared the principles on which he worked were perspective, light and shade. You can ‘distance things by darkening them and by narrowing the view more and more toward the end just as they do in painting’ he said. A painter by trade, as well as an architect of country houses and designer gardens, Kent used this principle in each of his creative disciplines. It was not a new idea, having been well understood the century before by Dutch painters and gardeners as well as French gardener extraordinaire to Louis IV, Andre le Notre (1613-1700). It was just new to the English experience. 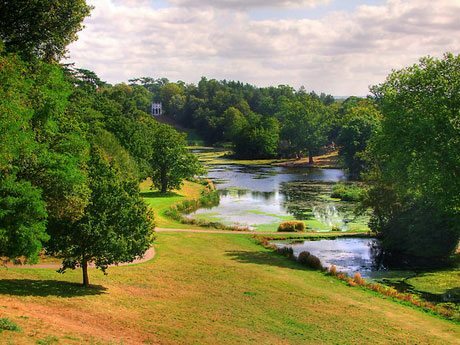 Painshill Park near Cobham, Surrey, England, was developed between 1738 and 1773 by the Hon. Charles Hamilton, 9th son and 14th child of the 6th Earl of Abercorn. It is one of the finest examples of an eighteenth century English Landscape Park. During the eighteenth century English gardens were carefully planned circuit paths. They prescribed the route through the garden the viewer would take. The design layout led them to traverse the garden only in one direction. In this way the particular view from any given section of the path could be aimed, framed and focused by clever plant material to direct the viewers attention and channel their line of sight in a given direction. Then a lasting impression was gained by managing to place a focal surprise element in the garden. Social commentator of the period Horace Walpole wrote about poet Alexander Pope’s garden, ‘The passing through the gloom from the grotto to the opening day….the assembling shades, the dusky groves, the larger lawn and the solemnity of the termination at the cypresses that lead up to his mother’s tomb are managed with exquisite judgment’. Management was the key word. Pope incorporated variety and contrast, arranging them to build to a climax at the end of the garden axis. Paths and benches were the key the would lead you on to the next resting-place for contemplation. At Painshill Park you can follow the path down a steep terraced hill and entered a Gothic temple. Then, and only at that precise moment, would a broad vista open up below. In this way visitors remained entirely mystified about the garden’s overall structure or scheme as they traversed through it. All these gardens, while founded on intellectual ideas, made no real claim upon the intellect of the viewer. They used subtle variety, allowing a unique and individual response, answering or responding to the individual’s emotional needs and mood. Imagination played a key role. There is nothing we cannot attempt in our imagination and in viewing a garden, even one we don’t own and cannot physically explore, we are still free to engage in a game of creative interaction. While it is beneficial to the mind and body to breath fresh air and exercise while viewing such a garden, the most important freedom it offered was the ability for the viewer to allow his or her emotions to all come into play, particularly dispersing grief and melancholy. Born near Paris Claude Monet (1840 – 1926) was the very incarnation of the painting style known as Impressionism. His horticultural wizardry was at the heart of his artistic genius. 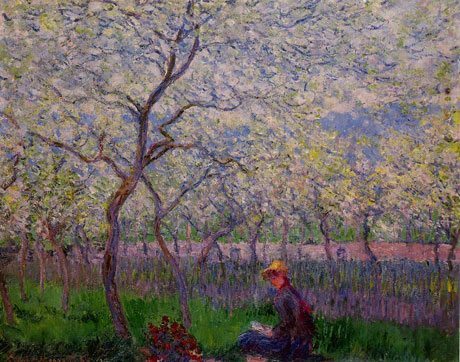 The life and soul of his paintings was inextricably bound up with that of Monet the gardener and it would consume much of his life. Monet spent his youth at Le Havre, where he met Eugéne Boudin (1824-98) a painter noted for his seascapes. He encouraged Monet to work in the open air and to ‘spend his life expressing his own instinctive way of seeing the most subtle nuances of colour, atmosphere and light in landscape’. 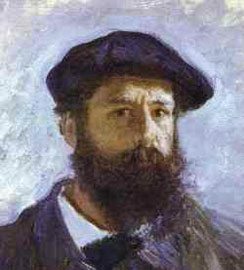 Monet moved to Paris where he met Pierre Auguste Renoir (1841-1919) who was, at that time, greatly influenced by the works of such luminary eighteenth century painters as Francois Boucher (1703-1770) and Antoine Watteau (1684-1721). 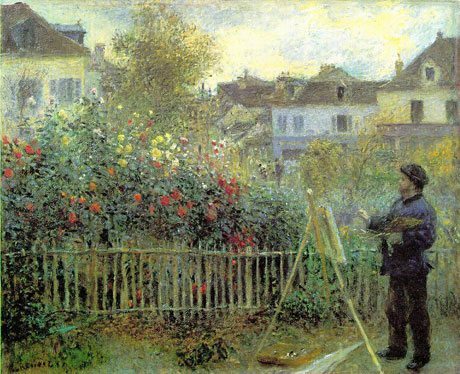 Renoir portrayed Monet aged 33 in 1873 at his portable tripod easel. A stocky figure, brush poised ready to catch the transient moment of light on his canvas. He placed him next to a stunning garden, rendering its opulent patterns and sensuous colours against a setting of fabulous foliage. For Renoir a human element in his paintings was essential. His women were all a healthy exultation of the flesh. He said, ‘she is beautiful and that’s enough!. 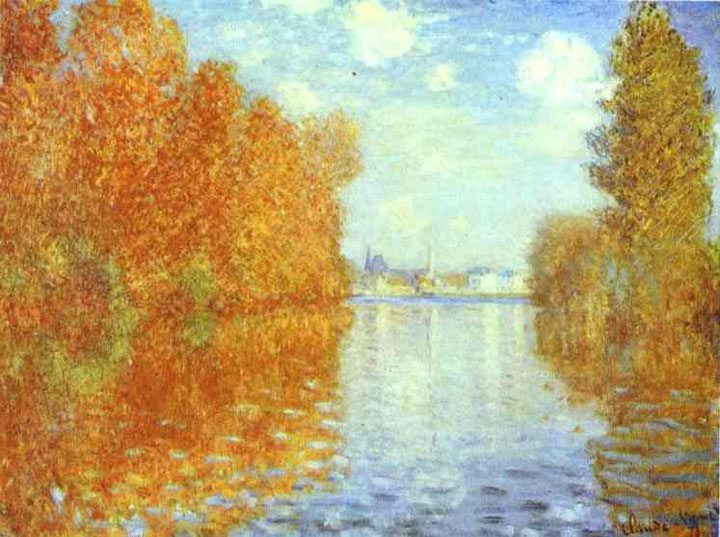 He re-interpreted the traditions associated with women in art in much the same way Monet did with the landscape genre. When you consider Renoir and his art a rich red rose comes instantly to mind. His admiration for women extended from the timid modesty of a young girl to the more considerable charms of the mature woman. 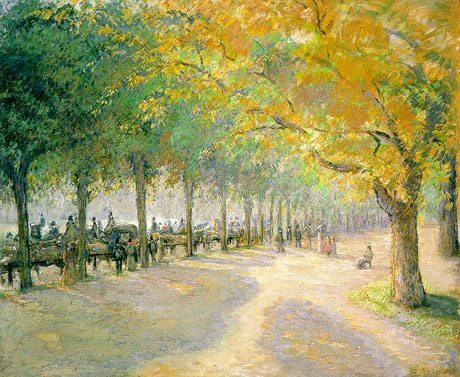 Monet met Camille Pissaro (1830 – 1903), who arrived at Paris in 1855. Pissaro had been influenced greatly by Jean Baptiste Camille Corot (1796-1875), whose main sketching ground was at Barbizon in the Forest of Fontainbleau. Corot’s style sacrificed accuracy of detail to unity of impression and harmony. Pisarro established a comprehensive relation of light to the sky and the ground. In this regard he was in close sympathy with the Impressionists, on whom he had a direct influence as a teacher and admired example. His work provides an impression of an intimate scene of country life, one in which the figures seemingly partake of their surroundings. They merge into a setting in tones of green and blue on a palette of honey and his technique allows us to feel the heat of a summer day, sense the vibration of light and experience the wholesome joy of the open and refreshing country air. Monet and Pissaro went together to London in 1870. 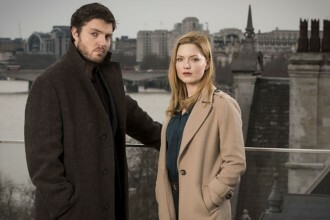 There they viewed the paintings of Claude Lorrain (1600 – 1682) and Joseph Mallord William Turner (1775 – 1851). 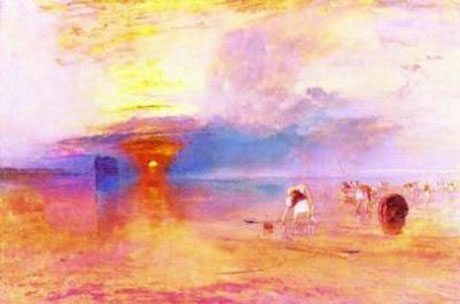 Many today would still consider that above all it is Turner who is the first impressionist, or father of impressionism. A great break through in the composition of pigments came from the study of archaic alchemy to the study of modern chemistry. New metallic elements such as Chromium (Chromos-Colour Gr.) could be treated with different acids and combined with various other metals to give a new wide range of colours from chromium yellow, to chromium orange to chromium red, as well as a completely new range of chromium greens. Monet and Pissaro seized upon the delicate, hazy, fleeting thing that Turner captured – the nuance, which was so beautifully rendered by the renowned ‘painter of light’ as Turner was known. They sought it and claimed it from all his works depicting water and sky, mists and flowers. The style of impressionism they rendered sought that indefinable moment in time using short, slashing strokes applied heavily or, otherwise scarcely grazing the canvas to depict reflections of light on water. 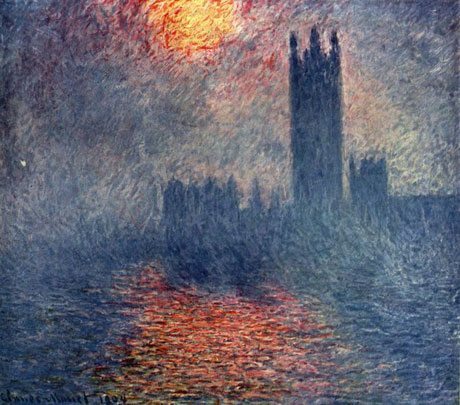 They were brought to life and form was suffused by colour in Monet’s painting of London through the fog. 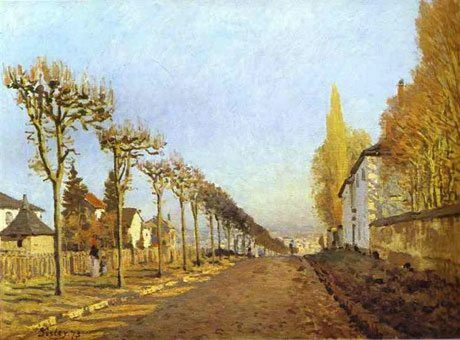 Monet also befriended a man of English ancestry, Alfred Sisley (1839-1899), who was desperate to be a French citizen. He also painted landscapes, particularly in the valleys of the rivers Seine and Loire in France as well as the Thames in England. His fresh, quick brush strokes with touches of lapis lazuli blue and an acidic green caught the mobility of the moment in a continual vibration of color and vitality, which is one of the virtues of impressionism. He painted Louveciennes, from the heights of Marly in 1873 and he became ‘noted for his subtle treatment of the sky and found freedom in painting leaves, grass, shrubs and the morning sunlight on the fields’. 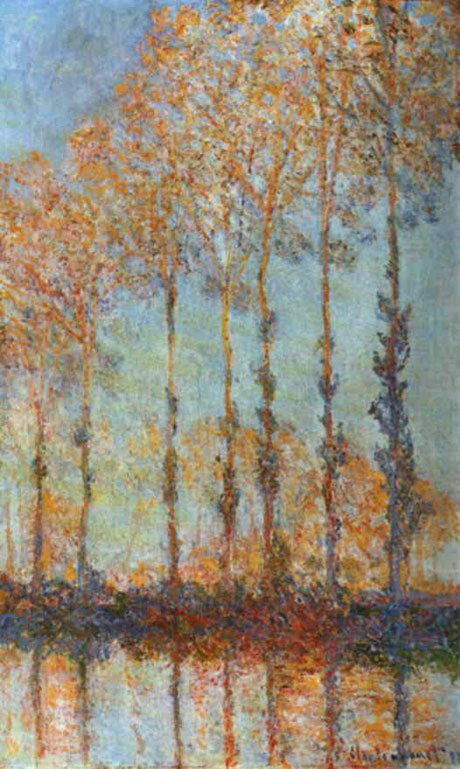 ‘If Monet had not been Sisley’s friend and contemporary’, a friend Eugene Murer stated, ‘he (Sisley) would have been the most perfect landscapist at the end of the last century‘. The four artists met at the fashionable studio of Charles Gleyre (1808-1874) a Swiss painter and teacher. He had studied in Italy, as well as traveled extensively in Greece and Egypt. He purchased the teaching school in Paris that they all attended, founded by Hippolyte (known as Paul) Delaroche, a noted romantic historical painter. 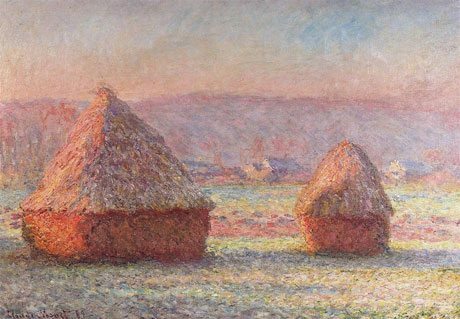 Monet, Renoir, Pissarro and Sisley became known as the four musketeers of Impressionism. The art movement was named for a painting Monet had exhibited at their first joint exhibition held at Paris in 1874. 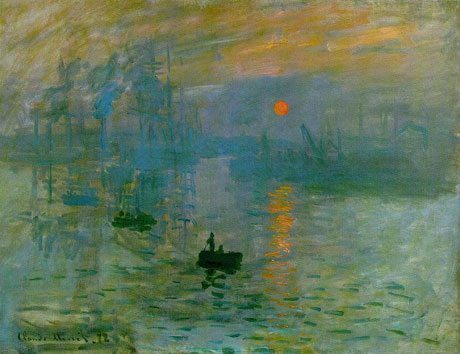 The painting is a picture of the sun seen through the mist over the harbour at Le Havre. There are many other works art scholars today would believe represent the aims and achievements of the movement more fully, yet this work did provide the movement with its name. The Japanese believe the viewer fills in the picture for himself or herself. So did Impressionism. It actively sought that type of reaction from the viewer. Boudin remarked that Monet set everyone an example ‘by holding fast to his principles’. Renoir said ‘without him, without my dear Monet who gave us all courage, we would have given up’. Monet began to paint in the open air from 1864, working with his friends in the pleasant village of Argenteuil on the outskirts of Paris. It was here that he became known for the aspects of light depicted in his paintings and he studied open-air effects the year round. He responded emotionally and creatively to the change of seasons. His stunning autumnal colours of red, orange and yellow reflect the glow of the foliage that while bright in itself, is even brighter when observed in full sunlight and a stark contrast to the water, clouds and sky. 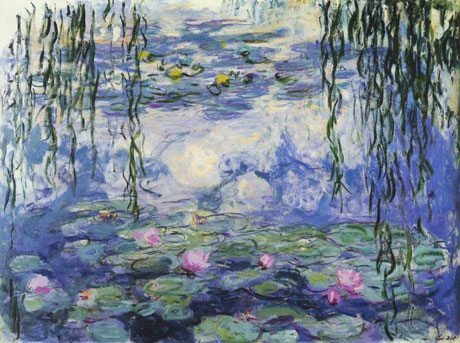 When he painted his Haystacks (1890-91) and the almost abstract Waterlilies, he was dubbed a ‘poet of nature’. He said of it ‘I have again taken up something impossible – water with grass rippling at the bottom. Its fine to look at, but it’s madness to want to paint it. The four friends and their followers were all sneered at, snubbed by society and quite literally starved for their art. Their paintings were refused at all the fashionable Paris salons, however this only served to strengthen their determination to succeed.